I've been spending my days in my office or at the library, writing papers. If all goes well, this term will be finished for me on April 25. It may even be spring by then! (Light snowflakes swirling around in the air today.) I encountered these two characters this afternoon outside the library. We're not allowed to take a cup of coffee into the building, so after a few hours of research I had to pack up all my materials, put on my coat, and go outside for a coffee break -- it's cruel and unusual. 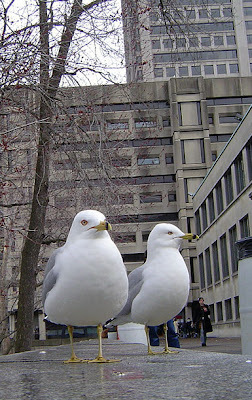 I may be projecting, but to me these gulls look pretty tired of winter. Oh, I may have ordered some KnitPicks Merino Style in Nutmeg so I can whip up a Blustery vest. That is all. I love that photo. I am equally tired of winter, and admire your nerviness in deciding to knit anything with "blustery" in the name -- I'm afraid it might jinx the onset of spring! So the coffee drinkers are hunched outside with the smokers?!! Those birds do have a rather disapproving expression, don't they. Wonderful vest, by the way. Thanks for the link! ha ha, i love the disgruntled looking birds. i can relate on the no food or drink in the library thing. i think that's why i can never get anything done while in the library - i work best while eating! McLennan looks oddly welcoming there. I guess you can never underestimate the power of the miffed gull. And your photo-taking abilities. I always sneak coffee into the library in a opaque water bottle--but I am bad like that! Blustery is very cute. Make sure that you strike a similar Bob Dylanesque pose in your FO shot! I hope you shared your coffee with the birds. They look like they need the caffeine. I may or may not have ordered yarn recently as well. Who wants to know? hahaha! i have the exact same pissed-off look on my face these days too - snow at easter? c'mon! Isn't it annoying to have to pack up and leave in order to have a drink! Best of luck getting all of your work done for the semester. thanks. you just sent me over the top and i started blustery this morning. i have the pipe dream of finishing it by friday - when we leave. good luck with you paper writing. No coffee in the library is just wrong, in my opinion. I'm all for banning cigarettes and food, but coffee is an absolute necessity for good research! Though I rarely take the side of gulls that look ominously like sky rats, I aver their pissed off demeanors. And clearly there needs to be an alternative to having to *leave* the library for coffee. I mean, really, what's that about?? I just found out that at our local university library, the new dean of libraries has decreed that food and drink are now allowed in the library. The rationale is that people can check things out and eat over them, so what's the difference? I'm betting that doesn't apply to the special collections room, though. Those poor birds look like they have cold feet. Glad I'm not a Canadian seagull!